Pickleball Direct is now part of Bois Blanc Sports! Pickle ball is one of the most trending sports in the United States. If you don’t know what Pickleball is, it is a racquet sport that combines three popular racquet sports; table tennis, tennis and badminton. Invented in 1965, Pickleball was born from boredom. Congressman Joel Pritchard, with his friends William Bell and Barney McCallum invented it with a lowered badminton net, fabricated paddles and a whiffle ball. When playing Pickleball, you will need pickleball paddles (almost similar to a ping-pong paddle, but not really), a net, and a pickleball. The ball itself is very unique, with holes through it. It travels the speed 1/3 of a tennis ball, and is usually light. A court is needed to play, which is 20x44 feet in size. It’s like a tennis court, except it has no outer or inner courts. In the middle is the net, which divides the court. 7ft from the net to each side of the court is the no-volley zone. Both sides are divided into two by a center line, which indicates where the server should serve and the players’ position when playing doubles. Bois Blanc Sports offers a wide range of graphite, composite and wood PickleBall Paddles from the top manufactures. 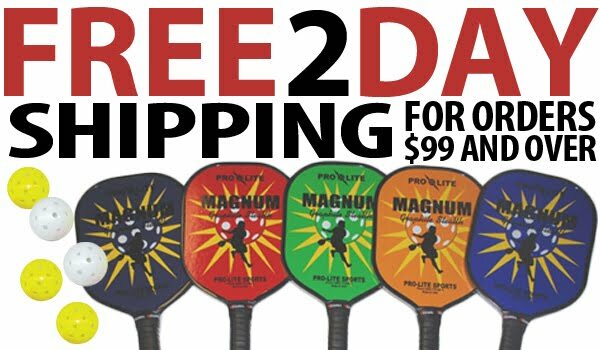 The popular Champion Pickleball Paddle is always the top seller, but they have a large selection of paddles made by Pro-Lite, S-Type, and PickleballNow that cater to any type of player. Serving the ball is from the right-hand side of each side of the court with an underhand move. The ball should go towards the right-hand side of the opponent’s side, following a diagonal line. If the opponent fails to return the ball, goes out of bounds, when the player steps in the no-volley zone, or the ball hits the net, a point is given. Scoring is based on who served first. The first server’s score is in even number, and the opponent’s score is in odd number. Pickleball is most popular in its home country, the United States. It slowly spread itself through Canada and through Asian countries such as India and Singapore. Even though it just started as a backyard sport and it was just incepted recently, Pickleball became really popular having 100,000 active players within US alone. In Canada, Pickleball earned a lot of players, reaching more than 5,000 within their four provinces: Ontario, Quebec, British Columbia and Alberta. Pickleball can be played with singles or doubles. You might not get it at first, but it’s very similar to badminton. So once you get the hang of it, it would be a lot of fun. You can play it with your friends, family, officemates or anyone that you know. Bois Blanc Sports offers a huge selection of PickleBall paddles, nets and sets, balls and more at discount prices. Best of all, orders over $99 get free two day shipping. In most cases, that means your order will be on your doorstep in only three business days. Free shipping and no taxes in 49 states, that’s hard to beat!